Hello fellow mixologists! It’s Thursday, and my Pub is open once again! I hope you guys are ready for some awesome drinks. Now, let me fix you up something special! Directions: Take a glass full of ice and pour over a shot of Coconut Rum. Add a large splash of Raspberry Cordial. Fill half the glass with Red Bull. Top it up with tonic water. Directions: Place some ice in a highball glass. Add the UV, blue curaçao and triple sec. Top with Smirnoff, and serve. Trigger Warning! This weeks’ post is covering a pretty controversial topic. If you are easily frightened, stop reading now! Konbanwa, everyone! It’s Wednesday, and you know what that means! Yes, it’s time to take a look at some more fascinating yokai. Now, let’s go on a journey to the “Land of the Rising Sun”! Kekkai are incredibly disturbing creatures of Japanese folklore. They’re depicted as small, ugly, monkey-like creatures that have hair growing backwards and two tongues. Kekkai occasionally come from pregnant mothers instead of children! When birthed, Kekkai will try to escape, scampering to the floorboards. If this nasty critter escapes, it will come back later and brutally murder the mother. (UGH!) This yokai was created with the intention to warn mothers about birth defects during child birth. You can stop a Kekkai by using a large spatula called a shamoji, and swatting it before it has a chance to escape. Koto furunushi are extremely strange objects of Japanese mythology. They’re essentially the spirits of old Kotos. These yokai look like wild beasts, and are capable of playing any song that was ever played on them. The yokai will play when nobody is around, and this will cause everyone to wonder where the music is coming from. Koto furunushi prefer to play old and often forgotten musical pieces. Hello fellow Marine Biologists! It’s Tuesday, and you know what that means! Yes, it’s time for us to dive into the deep once again. I hope you are ready to meet some incredibly bizarre fish. Now, let’s investigate the unknown depths below! The Vampire Squid is an incredibly grotesque creature of the deep sea. It has blood red eyes, and a pineapple-shaped body. The creature has many dangerous-looking “fangs” that appear on the underside of its mantle. The Vampire Squid has the awesome ability to spit bioluminescent clouds from its arms. This is used as a defense mechanism, and the cloud glows for ten minutes. This creature’s origins date back over 200 million years, and it has common traits of both squid and octopus. Pompei worm (Alvinella pompejana) Size: 15 cm Depths found in: 2600-2850 m: The Pompei worm is an extremely strange creature that is found on the bottom of the sea. It is said to be the only creature that can survive bathing in extreme temperatures. The creatures live on the walls of active undersea chimneys, which usually collapse under their weight. Marine Biologists are still trying to figure out how the worm resists such harsh temperatures. Hello fellow art lovers! It’s Monday, and my gallery is open once again. I hope you guys are ready for some fascinating works. Now, have fun exploring the gallery! Profit 1 by Jean-Michel Basquiat 1982 Acrylic and spray paint on canvas: Here we have a very unique piece by the late and great Basquiat. The work has a dark background that is filled with random splotches of blue paint and yellow lines. We also see a humanoid figure with no legs. The figure is wearing a blood red shirt, and appears to have a halo orbiting over its head. Its hands are raised in the air, and it has an enthusiastic expression. I love Basquiat’s use of black paint to bring out the vibrant colors of the painting. I would love to hear your thoughts in the comments’ section below. 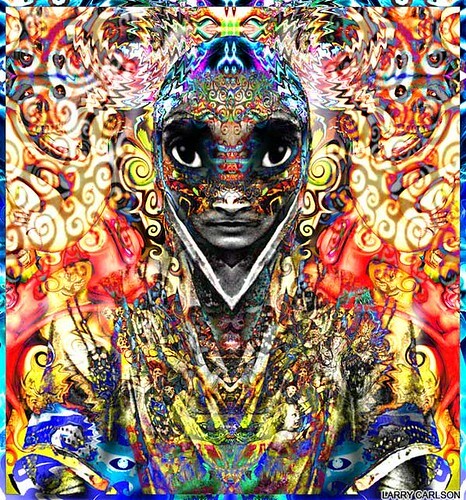 India Love 98 Digital Photography 1998 (info about material found on Larry Carlson’s website larrycarlson.com) This is an incredibly beautiful piece by “Digital Guru”, Larry Carlson. The mixture of colorfully trippy patterns and real pictures make this piece an awesome sight to behold. The main focus of this painting is the female figure in the middle of the piece. She has a hypnotic stare, and appears to be at peace. Half of her face is covered with an exotic paint that resembles a spiritual snake. There are strange patterns to each side of her face, and they are quite similar to the ripples in a pond. In conclusion, this is a dynamic and abstract work that fills the viewer with strong emotions and spiritual power. I would love to hear your thoughts on this piece in the comments’ section below. Black by Pearl Jam from the album “Ten” 1991: What better way to bring back an old topic, than with a re-review of a fantastic song! Pearl Jam has always been one of my favorite Rock bands, and this is what I consider to be their “Magnum Opus”. It starts with a melodic guitar riff, and then Vedder’s vocals start up. He completely kills it on this piece, massaging the ears with gruff singing and emotional lyricism.The tempo of this song is absolute genius, starting slowly, and then gradually progressing into a powerful Rock ballad. The song has aged very well, and it is still a pleasure to listen to today. I absolutely recommend this piece to anybody, and I really hope that you will find it to be a real gem of a song. Be sure to tell me what you think of it in the comments’ section below. Happy Listening 😀 AND ROCK ON!! Hello fellow food lovers! It’s Friday, and you know what that means! Yes, it’s time to take a look at another tasty dessert. Now, let’s dig in! Briouat is a fascinating pastry that comes from Morocco. It’s filled with meat, and usually mixed with pepper, lemon, and cheese. It has a small, triangular shape. Hello fellow mixologists! It’s Thursday, and my Pub is open once again! I hope you guys are ready for some fascinating drinks. Now, let me fix you up something special! Directions: Pour all ingredients into an old-fashioned glass 1/4 filled with ice cubes. Stir well, and serve. Directions: Throw some ice into a nice, large highball glass. Pour in the 3/4 shots of 99 Bananas and coconut rum. Then, simultaneously pour in the Banana Colada Fuze and your favorite root beer evenly until it reaches the top of the glass. Stir and enjoy.